Industry-leading detection: powered by Cassida’s patented M Algorithm™, the Quattro™ offers outstanding counterfeit detection combined with the lowest “false reject” rate of any manufacturer. The easiest operation of any counterfeit detector: the Quattro™ is able to authenticate a bill inserted in any of the 4 possible directional orientations– unlike competing detectors! Backed by Cassida’s exclusive “Counterfeit Shield Guarantee”: if a counterfeit bill is accepted as genuine, Cassida will reimburse you the full value of the bill within 72 hours! Compact, durable AND portable: the Quattro™ is designed for use anywhere counterfeit detection may be needed and its rechargeable battery means access to power is not required. 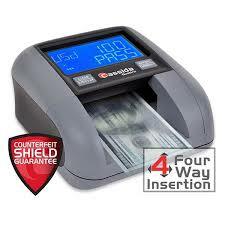 Easy-to-read high-resolution digital display clearly reports PASS or FAIL for checked bills along with their denomination for an added layer of security.